What’s the big idea? Well, there are quite a few actually. We’ve been developing for a while, a variety of methods for getting a vaporizer to detect what flavor or strength a consumer may be utilizing inside of their vapor device. These methods we previously created, utilized solutions that would only store information inside of the cartridge during the manufacturing process. However, this would be applicable only if we are talking about pre-filled cartridges, right? So, how would we go about detecting a flavor or strength from an e-liquid product, that actually is dripped, dropped, or poured into a refillable cartridge? Well, one answer is with Near-Field-Communication (NFC) Tags. We are able to apply a very cost effective (for pennies) programmable NFC tag inside of the packaging for the e-liquid, or even inside of packaging that contains pre-filled cartridges and then write unique information to that tag for later use. 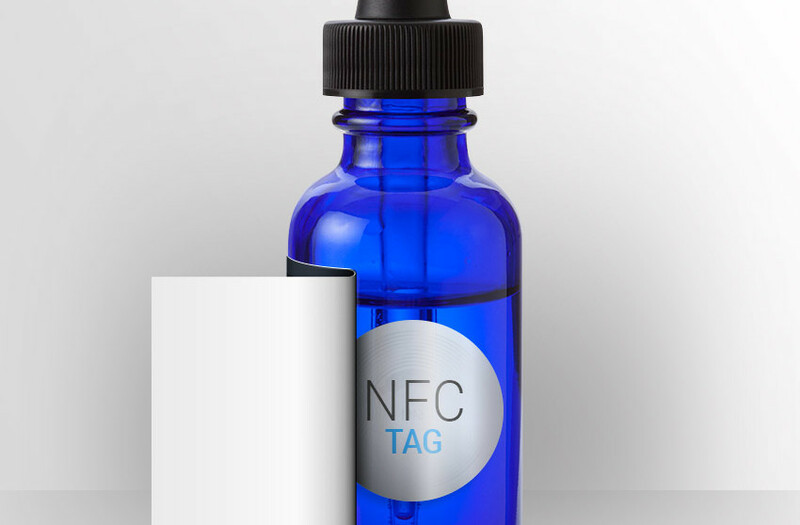 With a NFC tag, you can write or store small bits of data into the tags programmable memory, such as a product identifier, SKU information, source of origin, or even a Web-Friendly URL. By conforming to the NFC Data Exchange Format (NDEF) standards, we can write data into an NFC Tag, that can be read on a variety of devices, which are programmed to understand or interpret the NDEF standards for processing a wide variety of information. Now, that we know what type of information we can store into a tag, what can we do with it? Well, jumping back just a bit, the reason we wanted to be able to detect what flavor or strength a user is consuming, is because we wanted to make it easy and convenient for that same user, to detect and log product specific information into the Vapeix UpLink app, without having to think about it. This way, a Vapeix UpLink app user, can view more detailed information about their usage activity, to see visual reports on how much or how little of a product is being consumed. All the user would have to do, just before filling their cartridge, is tap the product to a Vapeix Powered and NFC enabled vaporizer, or directly to their smartphone to log the entry into the App. The way a Vapeix NFC compatible tag works, is that a when a user simply taps their NFC Compatible Smartphone to the product, within a split-second, the phone can read the information from the tag and send the information directly to the Vapeix UpLink app when installed, or to a web-browser for viewing information about that product. Furthermore, if the user doesn’t own a NFC compatible smartphone (almost every Android Phone, and current generation iPhones actually have this built-in) they can alternatively use a Vapeix Powered vaporizer which includes the NFC reader to process the information, which can be synced from the vaporizer over Bluetooth to the smartphone running the Vapeix UpLink App. What’s also handy about the Vapex NFC tag solution, is that it doubles as a quick-order tool, so not only can a user log related flavor, or strength information with UpLink, they are given a non-obtrusive option to open up a page in their browser which points to the respective product page within the Vapeix Market. The product page can display information provided from Brands that submit a product to the Vapeix Market directory, giving users more in-depth product information, and there a user can discover where they are able to purchase more. Lastly, this tag can just as easily be interacted with even before making a product purchase, if while shopping inside of a store, a user can quickly get additional information about that product to find out more details than what would normally wouldn’t fit onto small product labels. With the web, we don’t have a restriction of product label print-areas to be concerned with, since just about any information a brand or supplier would want to store along with that tag, can do so, making it even more useful for the consumer to obtain all of the information they are looking for. Next Post You can register with Vapeix, Very Soon.